Famous people born on FEBRUARY 5 are Aquarius who are generally restless. They have a strong desire to be self-regulating and morally correct. They believe in telling the truth no matter how hard it is to hear it. They have great intuition and an open mind. They are highly creative and can provide much incentive to others. 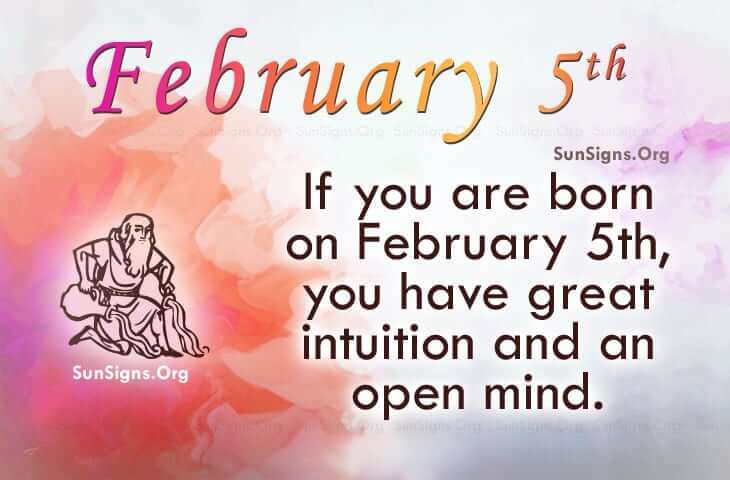 However, if you share this famous February 5 birthday, you can be a bit of a drama king or queen. You just can’t leave well enough alone. There are some individuals who think that you feel that you are superior. Then there are those that love you for who you are. As a rule, you like giving importance to yourself. When searching for the perfect career, famous people born on February 5 would do well in those jobs that require little supervision or little interaction with others. In love, they may have set their sights above reason. It could be a safety net as they may have issues relating to trust. If you share this famous birthday of February 5th, you can be a pigheaded Aquarius. These famous people want their independence but live up to certain standards. They actually inspire other people. They are an egotistical people’s person that can talk to anyone. They take care of their home but can be frivolous.